Bill Millin, aged 21, was considered to be unarmed on June 6th, 1944 as he jumped from the landing slope in Normandy on Sword Beach. The rest of his colleagues held rifles, but Bill’s hands were empty. However, he was dressed in full Scottish Highland gear, and as such he had his Sgian-dubh (a small traditional Scottish dagger) tucked down into his right sock. This was soon to be underwater as Bill waded ashore in three-foot depths. He could still catch the stench of his own vomit after a night in choppy waters in a small boat. You couldn’t consider Bill truly unarmed; he had his trusty bagpipes, held them high above his head to keep them from being soaked in the waters, and then held them in his arms ready to play. The sound of bagpipes had become such that the Germans (in the Somme) dreaded their sound and they named the pipers ‘Ladies from Hell’. 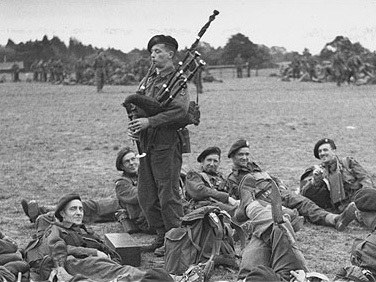 Bill Millin is playing his bagpipes in 1944. The sound of the pipes, however, boosted the spirits of all of the British troops; enough that on this fateful day, as the soldiers departed for France along past the Isle of Wight, the shouts and cheers of the men meant the pipes music were covered up by the noise and deafened the pipers who played. Bill’s playing of his bagpipes had been carefully planned as part of this particular operation. Whilst commando training close to Fort William he had become friends with Lord Lovat, the Officer in control of the 1st Special Service Brigade. Bill was a short man; he had a wide face and a ruddy complexion. His father was a policeman in Glasgow, and one of Bill’s earliest memories involved him being ‘poor’ and having to sleep on a deck while he and his family were returning to Scotland from Canada in 1925. Lovat was a sharp contrast to Bill; he was tall, thin, and handsome and owned a castle near Inverness. Lovat had made a request to Bill for him to become his very own, personal piper. The London’s War Office had made a decree which forbade any piper to play their music in battle, but Bill and Lovat had a plan to go against this, as very proud Scots. Lovat wanted the pipes to head the charge in what he said would be ‘the greatest invasion in history’. 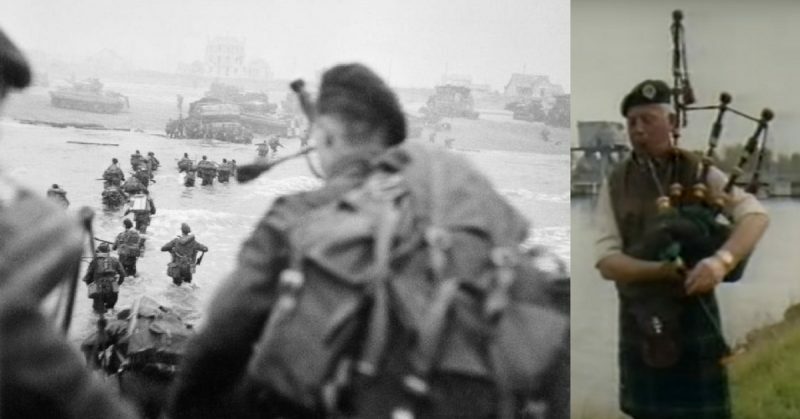 As Lovat and Bill waded up the sands of Sword Beach, Lovat said ‘Give us a tune, piper’. Bill started to play ‘Hielan’ Laddie’. Lovat gave this song choice a big thumbs-up and requested ‘The Road to the Isles’. Bill responded to the request by asking whether he should do the walk of the pipers and Lovat sad ‘Oh yes, that would be lovely’. Bil walked as a piper by the edge of the sea, back and forth three times. He later remembered the feel of the sand beneath his feet, quivering whenever mortar fire occurred and the bodies of fallen troops rolling in the surf and hitting his legs. For the remainder of this day, whenever he was asked to – he played.